In Hinduism, Shubh is ‘auspiciousness’ and Labh is ‘Profit.’ In some Hindu traditions, Shubha and Labha are the sons of Ganesha. In some Hindu traditions, Ganesh has two wives named Riddhi (material wealth) and Siddhi (intellectual and spiritual wealth). 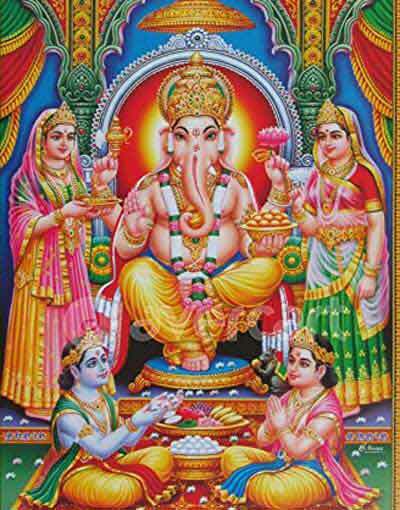 Ganesha has two sons named Shubh and Labh in Riddhi and Siddhi. Please note that some Hindu traditions do not follow the above said concept. It is believed that writing the name of Shubh and Labh along with Ganesha will help in achieving peace and progress in life. Shubh and Labh is worshipped by business people and shopkeepers for progress.